The Star-Advertiser’s columnists are often a welcome breath of air and an escape from an otherwise stifling ideology. Now we are building fences. The latest step in the help-the-homeless campaign comes from City Hall in the form of Mayor Kirk Caldwell teaming up with the City Council to spend $240,000 for a 1-mile, chain link fence along Kapalama Canal to block the homeless from rebuilding a shanty town there. If the way to firmly address the homeless issue is to shoo them away, then Honolulu is doing a great job. The article is very good, worth finding a copy of the paper if you can. Yup. That should be in a news article someplace, also. In his final report on housing for the homeless, [Russ Saito, Lingle’s accounting and general services director] urged government to drop the shelters program and instead move to the Housing First approach. In other words, put those without a home in a domicile. If not houses, then rent subsidies for those stable enough and without the mental health and drug abuse problems. About the only thing I would have liked to see, and Borreca may not have known about it (unless he regularly read Disappeared News), is that Lingle’s cuts to mental health services dumped many people onto the streets. Take this point as my own addition, it would have muddled his theme, which was very well executed. Before I let this go I do have another addition. Caldwell’s fence will make the city that much more ugly. The solid row of planters around Thomas Square would never have been installed by a proper landscape designer or competent city planner, nor did it follow Complete Streets, if that was in effect. The sidewalks were narrowed drastically and the public was not consulted on it. 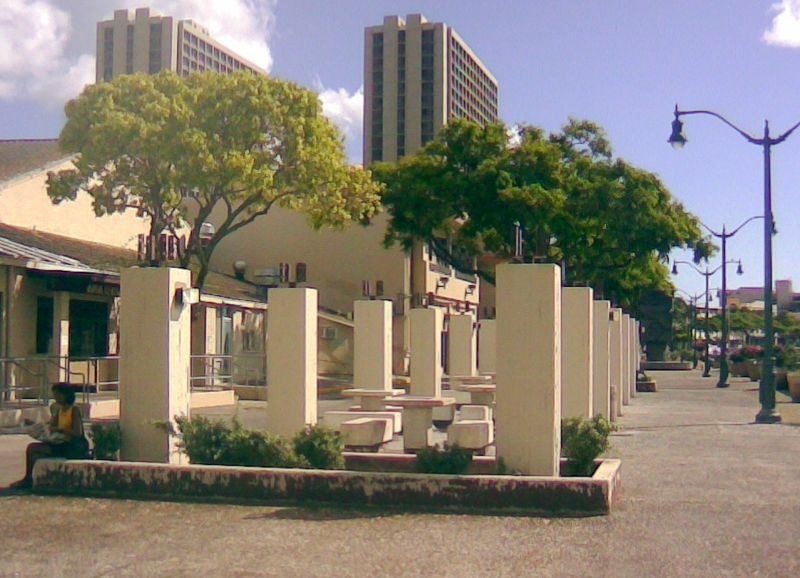 Mayor Mufi was trying to wipe out gambling and the homeless along the Nuuanu Stream in Chinatown, so he removed the tops of the trellises leaving ugly posts with rusting brackets and broken glass lighting fixtures. The gamblers moved across the stream. Those now awful posts are still there. And starting probably from Carlisle (? ), bus stops were modified so that the homeless could not sleep in them. Comfortable benches were removed and replaced by a couple of small, hard, round toad stools which meant the elderly could no longer sit while waiting for the bus. And they are ugly toadstools. So now it is to be a $240,000 uglifying chicken wire fence. This strategy is damaging to the rest of us, and solves little. Galvanized wire fences are ugly. The canal should be an attractive public asset. The tents will move elsewhere, the fence will remain as did the toadstools and ugly columns, and Honolulu will be worse off than it was. And the housing crisis will be no closer to solution for all this expenditure.